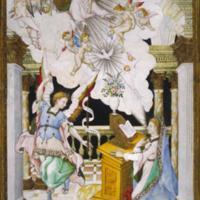 A celebrated painter of manuscripts and miniatures created this small painting of the Annunciation. The artist, Luis Lagarto, came from Granada to New Spain and in much of his art he drew his inspiration from European models and conventions. In this painting, he set a biblical scene in an elegant Renaissance-style patio. Luis Lagarto’s work is renowned for its delicate style of drawing, easily visible in the figures here. He pictures the Annunciation—the Angel Gabriel’s announcement to the Virgin Mary of the impending birth of Christ—a common subject in European art. He creates an imaginary architectural setting with columns that seem to support nothing, arches that span no clear space below. This imaginary, yet seemingly “real” architecture, along with the elongated human forms, align Lagarto’s work with Mannerist painting styles known in Europe in the 16th century. At the top of the column on the upper right, the artist signed his work, “Luis Lagarto F[ecit] 1610.” Although this painting is only 12 inches (30.5 cm) high, its painted frame of the work emulates large-scale paintings of its day. Luis Lagarto was a famed manuscript illustrator who worked in Mexico City and Puebla. His sons were trained in his workshop, and they continued their father’s work, creating choir books and bibles for wealthy patrons all over Mexico. This “framed” work was signed and thus meant as an independent artwork although created of the same materials as an illustrated book. While we do not know who commissioned this image, the visual connections between Lagarto’s image and Mannerist painting styles popular in Europe in the 16th century would have been appealing to Spanish and Creole patrons in New Spain. The work was drawn on vellum, made from the carefully prepared hide of a lamb, calf, or kid, and then colored with thin layers of gouache, where pigment is suspended in water-soluble, opaque glue. The manuscripts of Luis Lagarto and his sons are to be found in many collections, but among the most famous are the choir books that Lagarto created for the Cathedral of Puebla. Lagarto created this delicate painting at the time he was finishing that major 11-year commission. Today the painting is part of the Museo Nacional de Arte collection in Mexico City. Devotion to the Virgin was widespread in Spanish America, as it was in Europe, and worship was carried out in both public spaces and private spheres. Because of its size, this exquisite work was clearly meant for private viewing. Given the cost of such a work, its owner was undoubtedly a wealthy person. It could have been used in a convent, where nuns were often both wealthy and well-educated. The viewer was likely meant to identify with Mary, interrupted in a moment of quiet contemplation of a book. Burke, Marcus. 1990. 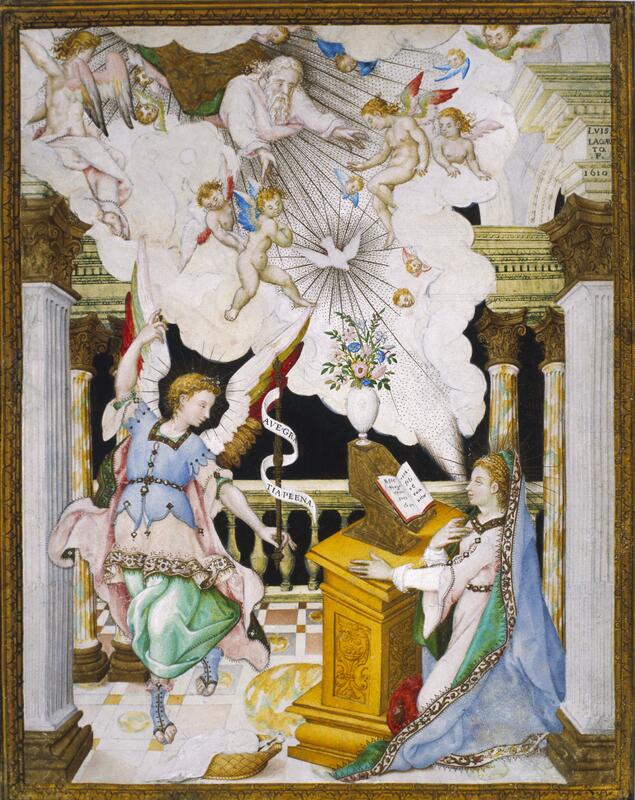 “The Annunciation.” In Mexico: Splendors of Thirty Centuries. New York: Metropolitan Museum of Art, 303-305. Normore, Christina. 2004. "Luis Lagarto." In Painting a New World: Mexican Art and Life, 1521-1821. Donna Pierce, Rogelio Ruiz Gomar, and Clara Bargellini, eds. Denver: Frederick and Jan Mayer Center for Pre-Columbian and Spanish Colonial Art at the Denver Art Museum, 123-126. Palou Pérez, Pedro. 1997. “Chiaroscuro prayer: colonial painting in Puebla.” Artes de México 40: 93-95. Romero de Terreros, Manuel. 1950. La biblioteca de Luis Lagarto. Mexico City: Imprenta Aldina. Tovar de Teresa, Guillermo. 1988. Un Rescate de la Fantasía: El Arte de los Lagarto, iluminadores novohispanos de los siglos XVI y XVII. Mexico City and Madrid: El Quilibrista and Turner Libros.